These Californians put out a thrash album, a mini-LP on vinyl in the heady days of the 1980’s by Wild Rags (alleged rip off) records label mogul, Ricardo Campos. Preacher’s record has to be one of the worst excuses in Heavy Metal to ever come down the pike. 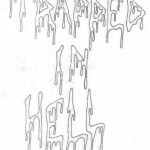 The abysmal release by Preacher, in question, is ‘Trapped In Hell’ featuring instantly forgettable stupidity like ‘Cry Of The Demon’ and ‘Sacrifice The Whore’. They should have sacrificed Ricardo Campos who, as the story allegedly goes, traipsed off to prison for tax evasion, in the years following the fall of his beloved Wild Rags. of the great bands stuck on this crappy label. Nobody made any money either but the big cheese Mr. Campos. Maybe signing a band named Preacher was his attempt at redemption.